Description: Unusual map of an anomaly showing the district of Richmondshire in the North Riding of Yorkshire. Richmondshire still exists as a local government district. Description: An early map of the North Riding of Yorkshire. Unusually, the dedication is to a lady, Margaret, the late wife of Thomas Danby a prominent local landowner. Description: Elaborate copper-engraved map of the North Riding with figurative cartouche and coats of arms with cherubs. Fine original hand-colouring. Description: North Riding. County map divided into hundreds. Decorative borders flank both sides. Original colour. Description: North Yorkshire, highlighting cities and towns and with a decorative cartouche. Coloured. Description: Grand map of Yorkshire's North Riding with informative and descriptive text. Panorama of York. Original colour. Description: North and East Riding of Yorkshire. Large, striking county map with a vignette of York Minster. Original colour. Description: Colourful county map of North Yorkshire. Major roads are marked with blue lines and planned railways with red lines. Original hand-colour. Description: County map of the North Riding set within a Victorian illustrated border. Coloured. 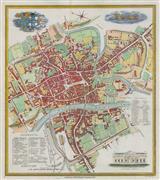 Description: Copper-engraved map of York published by local booksellers and printers Henry Bellerby & John Sampson. Includes indexes to the churches and public buildings in the city. Coloured.